It did not help that on Rosmarina there was no such thing as privacy, one house so near to the next that a man could hear his neighbor’s toilet flush. Grudges went back generations and children were judged by things their parents had done, sometimes years before their birth. Magdalena and her younger sister Jadranka live on the island of Rosmarina with their grandparents. Their mother Ana is alive but she lives on the mainland of Croatia. The rest of the family, including a cousin their age has left for America to escape the specter of Communism with its web of informers and spies. 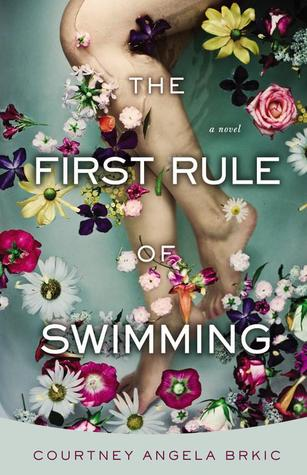 It is the sisters’ lives and relationships that is the focus of Courtney Brkic’s debut novel, The First Rule of Swimming. Magdalena is the ballast to the balloon of Jadranka’s artistic and dramatic temperament. As she grows older, the island begins to feel more like a prison she must escape to flourish but for Magdalena it is the root of her existence. She teaches school and still sleeps in her childhood bedroom while helping her grandmother look after her beloved grandfather who has suffered a stroke. When their cousin, Katarina, offers Jadranka the chance to move to America and live with her family in exchange for helping with her children, she accepts. It is the first time in their lives that the sisters are separated and when Jadranka disappears, Magdalena feels she has no choice but to retrace her steps, go to New York City and find her sister. She has no idea that the physical journey will be miniscule compared to the emotional enormity of what she discovers about their family. The events of the past in The First Rule of Swimming act like the tide, bringing up new bits of detritus and things better left buried while sweeping out preconceived notions or beliefs about the past. Magdalena is so certain of her reality that as the layers peel back she is buffeted by what is true and what she believed. Brkic enhances this feeling of being adrift by writing the novel from various points of view, including Luka, the girls’ grandfather who has had a stroke but is very much aware of the world around him and contributes to the story when his mind churns back to the past. The changing viewpoints allow the reader to more fully experience the truth as it unfolds. I love that metaphor of the tide you use, it is very apt. It is hard to know whether silence actually assists humanity, because we have a tendency to repeat mistakes and often the victims of oppressors end up oppressing other communities themselves. One has to wonder if it will ever be possible to end this cycle of annihilation; as long as there are armies and defense strategies, humanity will always remain in danger I believe.